이스탄불, 터키의 세컨드 홈 호스텔 | 호스텔월드에서 예약하세요. The following group types are not accepted by this hostel: High / Secondary School If you have misrepresented the type of group you are booking for, your booking may be cancelled by the hostel." 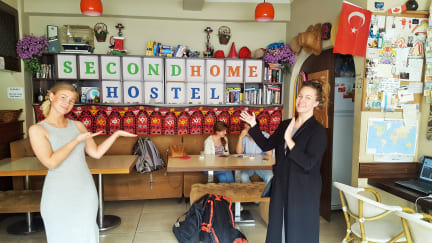 Our Hostel is located between the old town and the new town, the ideal location to discover this whole city and what it has to offer. We have an airport pick up service for very reasonable prices. We are near Tramway stops, Marmaray (Metro) stops, Bus stations, Ferry piers and Airport Shuttle stops, making it easy to get to all of the sights of Istanbul and beyond. The common area of the property consists of a guest kitchen and a cozy lounge area where guests can read, surf the net, watch tv, play backgammon, card games etc. 24 hours open for chilling and chatting! Telephone, Fax, Print and Scan services available for a nominal fee. We make waterpipe between 19.00-02.00 and you are free to bring your own drink, food and have up there! Each week we do Turkish Dinner Night, followed by a pub crawl to Taksim (the centre of nightlife and live music in Istanbul). There are common showers and bathrooms in the corridors. Private ensuite rooms have air-conditioning and shared rooms have fans and all rooms have heating. We have security cameras at key locations with 24 hour reception and a safe box in which you may store your valuables. *We are 5 storey building but unfortunately we don't have an elevator! -Cancellation policy: 3 days before arrival date. In case of a late cancellation or no show you will be charged. -The 9 bed mixed dorm is located in basement! -Breakfast is not included in the given rates. You can book it for €3 per person per night. Travelling alone or in a group, there are plenty of opportunities to socialize. Enjoy a delicious barbecue on our roof top terrace. Play backgammon, smoke hookah, listen music or just admire the breathtaking view over the Bosphorus and Europe side of Istanbul. We have everything you need to enjoy your stay and feel comfortable. 위치괜찮구여 시설도 좋아여 특히 직원분이 너무 좋았어요!! 구시가지에서 굉장히 가깝습니다. 블루모스크 아이야소피야까지 걸어서 10분정도 밖에 되지 않고 어디든 충분히 걸어다닐만 했습니다. 조식도 그정도만 무난한것 같습니다. 저희가 도착했을때 리셉션 직원이 이제 일한지 이틀밖에 안되서 뭘 물어봐도 정확한 정보를 얻지는 못했지만 그래도 참 친절했습니다. 4박하는 동안 불편함 없이 지내고 갔습니다.